How to know if you hip flexors are tight. How do you know if your hip flexors are tight? How do you know if you have a tight rectus femoris, iliacus or psoas? Do you go by feel or is there an objective way to measure these things? This picture of the Thomas test from http://www.positivehealth.com shows the angle the thigh should fall below horizontal. D Harvey published a short paper in the British Journal of Sports Medicine in 1998 on the range of motion he measured with the Thomas test in 117 elite tennis basketball, rowing and running athletes in Australia. He found that the vast majority of these athletes exhibited flexibility that allowed the thigh to hang below parallel. The average was 11.9 degrees below. If your thigh doesn’t reach parallel, you have short hip flexors. This test may have poor reliability so expect variation in range of motion each time you do it. I recommend doing the test every day for a week, if you consistently find a limitation, then you have tight hip flexors. 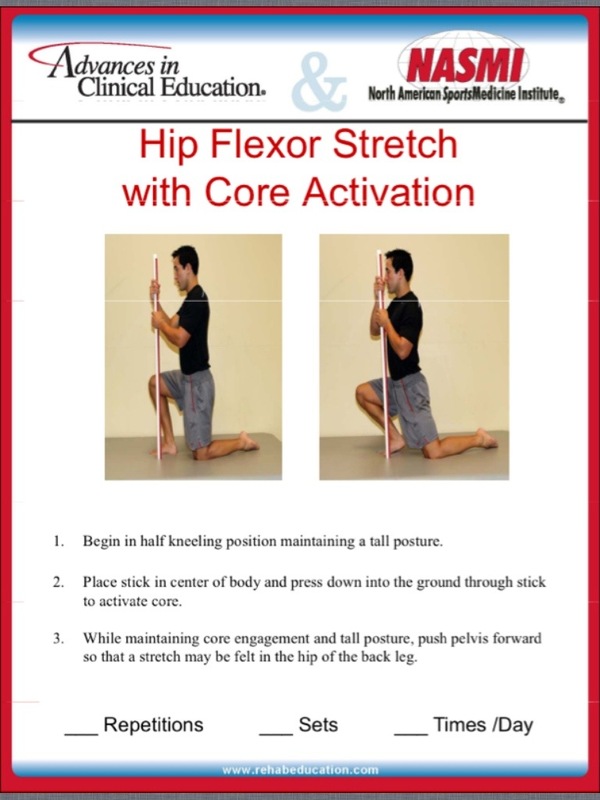 Here is a stretch I often give clients and patients with short hip flexors. If your knee straightens out a lot you have a shortrectus femoris. 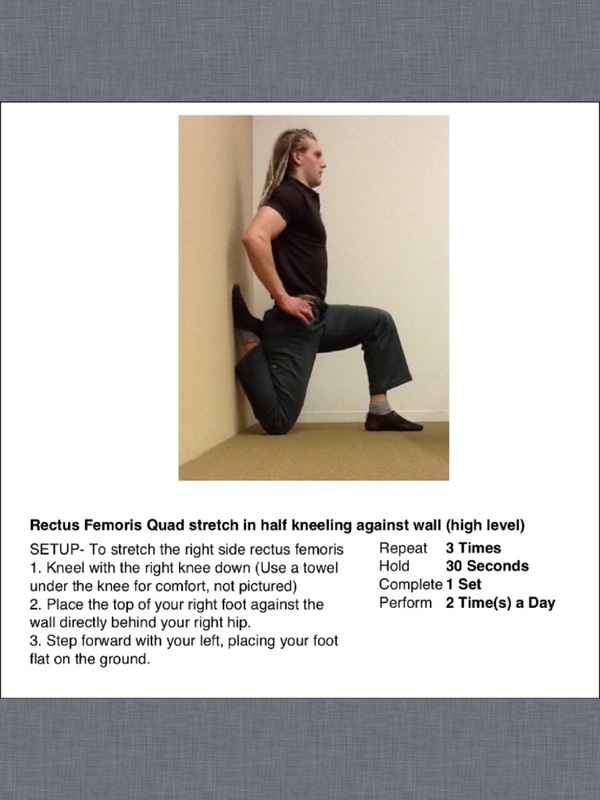 Here is a stretch I often give clients and patients with a short rectus femoris. Before we can answer the question of whether the hip flexors are tight, we need to be clear about what we are asking. What then is tightness? I like the approach that Shirley Sahrmann PT PhD, takes to the question of muscle tightness. She breaks it into two different measurements: shortness and stiffness. Shortness refers to the length a muscle can extend and stiffness refers to how much resistance is felt as that muscle is lengthened. Taking this approach in analyzing the Thomas test, I look at the ability of the thigh to drop 14 degrees below parallel (shortness) and I also feel how much resistance there is to get to that end range by supporting their thigh and lifting it up and down (stiffness). Dividing an assessment into smaller and more detailed parts (stiff and short vs just “tightness”) makes things more complicated. This extra complication is only justified in my opinion if the intervention will be different as a result. I think it is a waste of time to measure things in more detail than I can address them in. In the case of muscle stiffness and shortness, I have different interventions for each of these limitations. -Activation of the opposing muscle groups For the hip flexors this would me contracting the glut max in different positions: lying face down, half kneeling, standing in an lunge stance, standing on one leg. -Strengthening of opposing muscle groups. For the hip flexors this would mean strengthening the gluteus maximus with resisted hip extension in standing and single leg hip hinges. -Practicing the through range movement to ensure activation of the opposing muscle groups. For the hip flexors this would mean extending the hip in a prone position, quadruped position and standing position without arching the back. -Passive stretching at end range: For the hip flexors this would mean a stretch in half kneeling, face down on the bed with the other foot off the bed on the ground in a hurdle position, or supine letting the thigh fall off the edge of the bed or a foam roller with the other thigh up to your chest. -Contract relax stretching : For the hip flexors I do this in the Thomas test position with my hand on the distal knee. -Hip Extension: Axis at center of greater trochanter. One arm of goniometer parallel to floor and the other arm in line with thigh to the head of the fibula. -Hip Abduction: Axis at ASIS. One arm of goniometer in line with thigh to superior pole of patella and the other arm pointing to the opposite ASIS. Subtract 90 degrees from the angle you record. What are the normal values for the Thomas test? Is the Thomas test reliable? 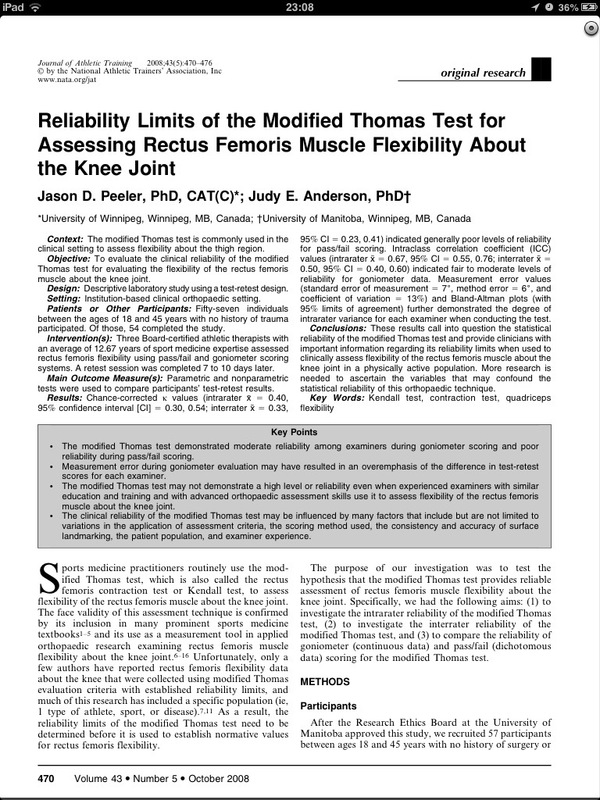 In 2008, Jason Peeler PhD and Judy Anderson PhD at the University of Winnipeg investigated the reliability of a slightly different version of the Thomas test. In this version, the patient lies on their back with both thighs supported on the table and then brings one thigh to their chest leaving the oer behind. The knee extends as a result of rectus femoris tightness and the angle of knee extension is measured. Three examiners who were blinded to each others results and their own previous results measured the 54 subjects one two separate occasions 7-10 days apart. Each subject was measured by all three examiners at each visit and the order of testing was randomized at the first visit then the same order was used at the second. Unfortunately, the results showed that the test was only moderately reliable. There was a lot of variation between examiners (kappa 0.33) and within one examiner between testing (kappa 0.40) of the same person. To quote from the study “The standard error of the mean values also depicted that the minimal change required to assume that a real difference exists between an examiner’s test-retest scores for the modified Thomas test was approximately 19 degrees.” The average amount of knee flexion was 47(SD12) for men and 51(SD12) for females. 2. Measure exactly the same way, on several consecutive sessions to establish the variation in measurement for you and that patient/client. 3. Look for gross asymmetries or major limitations only: If your thigh doesn’t reach parallel, you have tight hip flexors. Making a big fuss over small changes in range of motion on a test with a large error range will lead to a ghost hunt. Hi I have started getting extremely right hips on my left side it’s so bad ican barely put my socks on in the morning. Before they weren’t bad as I could do weighted squats with full rom and even rest in the bottom position with 100kg. After I had acl surgery my right leg atrophied . Scince then I have built my legs back up but the left right side is way stronger. It only really got tight after I came back from the surgery. I cannot even sit down for too long or it becomes painful. Could it be because of the muscle imbalance? Or should I keep stretching my hips? I also have very short hamstrings. Yet my side split flexibility is not too bad.